My sewing machine and I have been playing together quite nicely lately. 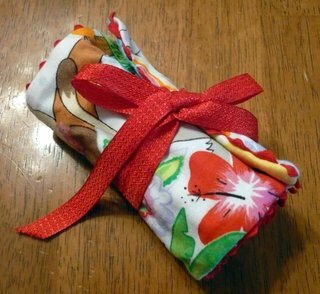 I made this crayon roll (thanks for the awesome tutorial, Cindy!) for my youngest, using fabric that she picked for the outside. She's totally into cats, likes to crawl around (half cat, half puppy) with things in her mouth, licking people and meowing. Yeah, whatever. At least she doesn't eat out of the cat's dishes. 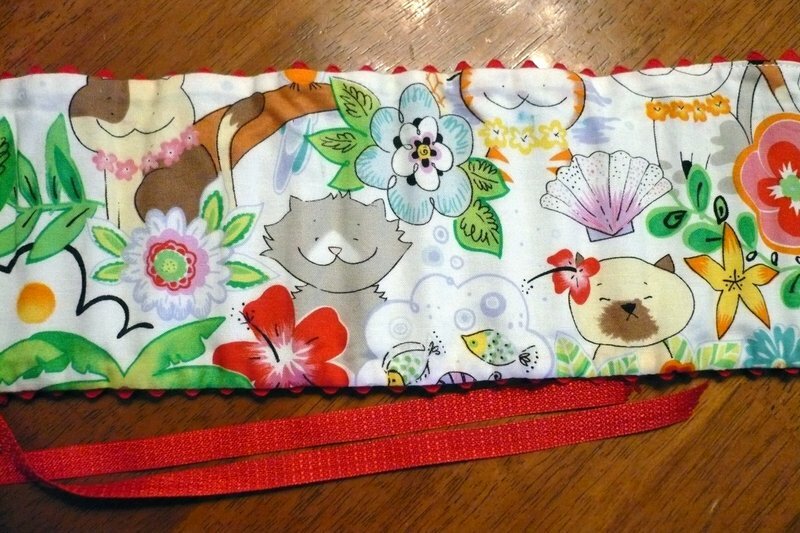 It really is a cute fabric, from the 2004 Alexander Henry "kitty getaway" fabric collection. 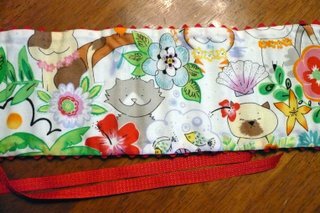 I only had 3 fat quarters of it, unfortunately, but parted with one because, really, who can deny a two year old when they pick out a fabric? (Amy, I know you know what I mean.) I'm trying to learn how to let go and use. up. my. stuff. I keep reminding myself that I have major storage issues, and can't get anything new if I don't use up some of the things I already have. Since the new year, I've been helping my kids donate to charity or otherwise get rid of one of their old toys whenever they bring a new one home, so I should follow my own rule. Ha. Well, we'll see how well that goes. Good theory, anyway, don't you think? After I finished up the sewing and pressing, Becca used a cotton swab and a little dish of water, erasing all the sewing lines I'd drawn. Then she dug through our crayon bucket and picked out the nicest, longest crayons in the prettiest colors to fill up the pockets. 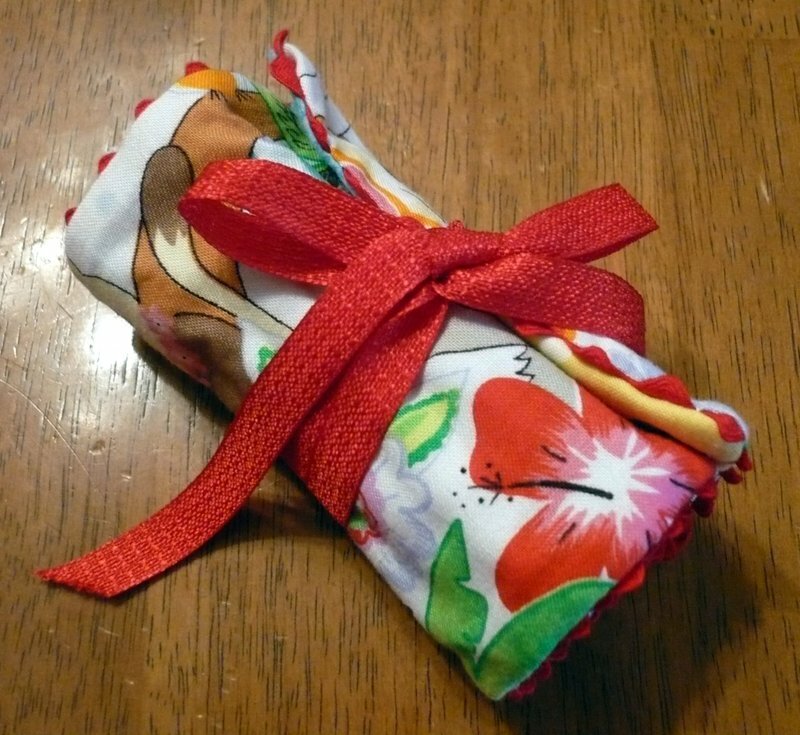 She was so proud when she presented the roll to her sister, saying, "Oh, Jessie-ca, look what I made for you." Then she paused, and added, "Well, Mommy helped, too." Jessie loves it. How do I know? Well, she took it to bed that night and slept with it next to her pillow. Long crayon generosity - how sweet. And Johnny is always begging to 'play cats'. What a shame about that pesky Atlantic Ocean thing.